Local print coverage of jazz is often limited to a few lines from Tom Surowicz or Britt Robson under the “Jazz” listing of “The Big Gigs” in Friday’s Variety section of the Star Tribune. Sometimes it would seem that there are no “big gigs” on the jazz scene. Occasionally the Strib runs an in-depth preview when one of the giants of jazz comes to town, like Return to Forever or Christian McBride. More rare would be a review of a jazz club gig. 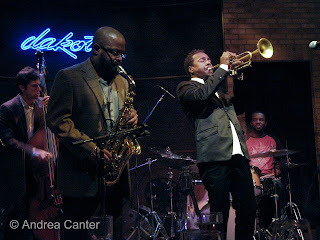 So count it as a) unusual and b) highly appropriate that the St. Paul Pioneer Press ran a review of the first set of the Roy Hargrove Quintet’s recent visit to the Dakota. Dan Emerson’s description of one tune easily described the full two-night run as a “tour de force display of instrumental firepower.” I was there for three of the four sets, and after each one, heard many comments to the effect that this was one of the most exciting Dakota shows in recent memory. My memory was not all that challenged as I had heard this ensemble only a week earlier at the Detroit Jazz Festival, as well as Hargrove’s previous Dakota gigs, most recently in November 2007 with the same quintet. 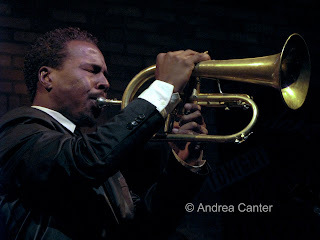 Hargrove is one of the all-too-rare jazz artists of his generation who never, I mean never, fail to deliver the goods at full throttle, regardless of the audience or venue. They embody all of the elements that make live jazz live and irreplaceable regardless of technology—they play in the moment, and each moment as if it was the only moment in time. The first set on Sunday night came off as if the band had been warming up for hours, yet each successive set proved just a bit more spontaneous, more passionate than the last. By the final set Monday night, we were beyond the sound barrier—not in volume, but in raw emotion and technical brilliance. I can’t say it was the best show ever at the Dakota as different configurations and styles defy comparison. I can say it was one of the most inspired horn ensemble I’ve heard in the Twin Cities, and perhaps the finest straight-ahead horn gig I’ve heard live, period. And I wonder what we would have heard had the band stayed on for one more night? What makes the Hargrove ensemble stand out in an era of fine mainstream trumpet bandleaders (Nicholas Payton, Sean Jones, Christian Scott, Irvin Mayfield) is a confluence of elements: There’s Hargrove himself, of course, often dubbed the greatest trumpeter of his generation or even the greatest trumpeter working today of any generation. In a sea of talented bandmates and volcanic eruptions, Roy manages to command center stage...except when he leaves the spotlight to focus attention on his cohorts. Like a model for the street edition of GQ, he dressed in shiny black, white shirt and a bowtie, oddly (if weirdly effectively) paired with stark black and white Nikes (or more likely, whatever the latest hot name in cross-trainer footwear). For the first couple tunes in each set, he peered through hip shades which were discarded midway, as was the suit jacket. But put the trumpet to his lips, and nothing distracts from the sparkling palette of sounds, assertive dry blasts, soft and creamy ballad tones, scoops and squeals, funky slides, sonic somersaults, hard bop ribbons. And there may be no better lyricist on flugelhorn. He burned through phrases like a blow torch (“Nothing Serious);” his ballads flowed like sweet breezes (“Never Let Me Go”, “I’m Glad There’s You”); he convincingly testified with the blues (“Bring It Home to Me”); with a Harmon mute he was as mournfully sublime as Miles (“Society Red”). But perhaps Hargrove’s greatest talent is as bandleader and builder of ensembles that collectively match his own versatility and energy. Those other elements are four: 1) Bassist Danton Boller whose walking lines carved the terrain of “The Stringer” and “Society Red” and lent Latin pulsations to tunes like “Nothing Serious;” 2) young monster drummer Montez Coleman who reminds me of the muscular assertiveness of local percussionist Kevin Washington, dancing through fire on pieces like “Once Forgotten” and “Camaraderie”; 3) sympathetic and inventive alto saxman Justin Robinson, whose Bird-inspired hot-poker phrases fueled “Nothing Serious” and particularly “The Challenge” while engaging Hargrove in harmonic collaborations throughout; and 4) much-heralded young pianist Gerald Clayton, whose phrasing ranges from giddy eccentricity (“Strasbourg-St Denis”) and forward thrusts (“Camaraderie”) to bluesy abstraction (“I’m Not So Sure”) to surprising delicacy (“Society Red,” “Time for Love”). Scary, Clayton was only the runner-up in the 2006 Thelonious Monk Piano Competition. 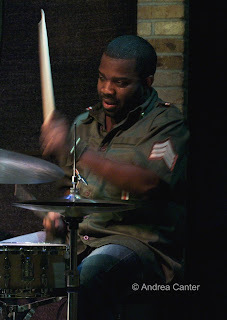 I caught part of Gerald’s trio set in Detroit last weekend—he’s sure to be a significant voice for decades to come. And so blows Roy Hargrove, already a significant voice, but at not quite 39 his trajectory is merely an abstract concept. And we are merely mortals, enjoying every note.